115,631 members of 30,629 families are affected in the Northern Province due to heavy rains. 9505 members of 2742 families have sought refuge in 51 special camps set up in public places and temples, according to latest reports. 30,452 members of 8375 families had been displaced in Jaffna district and 41,839 persons of 10,173 families in Mannaar district. The breakdown of the displaced in Mannaar district by DS division is given below: Naanaaddaan DS- 5416 persons from 1370 families, Musali DS-11723 persons from 2460 families, Mannaar DS-11174 persons from 2610 families, resettled Madu DS-7562 persons from 2015 families- Maanthaimeatku DS-6414 persons from 1718 families. 143 houses have been completely destroyed in Mannaar, 2138 houses have been damaged and twelve irrigation tanks (Muslai-04, Naanaaddan-02, and Maanthaimeatku-12) have breached. Paddy crops in more than two thousand acres have been destroyed, according to officials of the Department of Agriculture. This was worst case of floods since 1994 in Mannar, according to official sources. 21,564 persons from 5628 families have been affected in the Killinochchi district. 3745 persons from 998 families have sought refuge in twenty camps. Health and medical officials warn of a possible epidemic outbreak in Vanni. But the SLA authorities have refused permission to aid organizations to supply mosquito nets to the victims. In Mullaithivu district 16,997 persons from 5274 families have been affected, according to the Government Agent Mr. Vethanayagam. But several aid groups have said that they are unable to identify the urgent needs of the victims. In some areas landmines are washed away causing fear among displaced and resettled people, aid sources said. The Government of Sri Lanka has allocated a sum of Rs 42.1 million for providing relief for the entire island. Eighty percent of the money has been allocated for the south, sources said. Rs. 10.1 million have been allocated to the Colombo district where the damage by rains is less compared to other parts of the country. 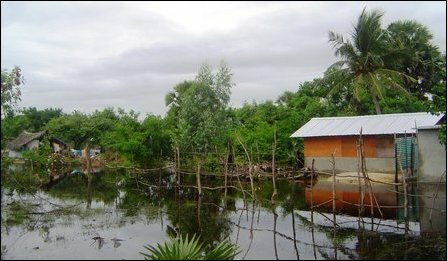 International aid organizations have been maintaining silence at a time when emergency assistance is needed to Vanni people who have been badly affected by rains.